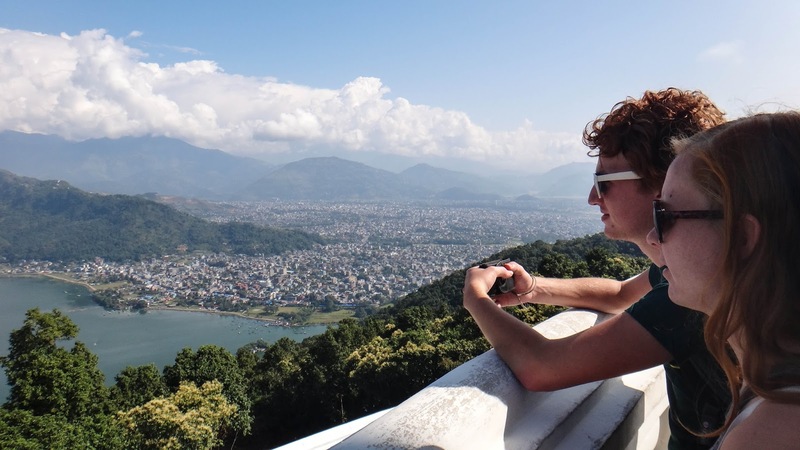 Full-Day Private Pokhara City Tour | Adam Tours & Travel Pvt. Ltd. This 10-hour private excursion takes you to explore Pokhara, a resort city of remarkable beauty. Start with a sunrise tour of Sarangkot and experience the serenity of Phewa Lake and the magnificent summit of Machhapuchhre rising behind it that creates an ambiance of peace and magic. You will also visit the city’s most popular sights, such as Bindhyabasini Temple, Devi’s Falls, and the Tibetean Refugee Camp. In the early morning at 5am, your guide will pick you up from your hotel in Pokhara. Head towards Sarangkot to witness the magnificent sunrise and enchanting views of the Himalayan peaks and ranges of Machhapuchhre (Fish Tail), Dhaulagiri and Annapurna. At 8am, proceed back to your hotel for a quick break or stop for breakfast in the city. At 10am, your tour will commence again as you head for your full-day tour of Pokhara’s sights. Enjoy boating at Phewa Lake, the second largest lake in the country, and the center of all attractions in Pokhara. See Barahi Temple, built on an island in Phewa Lake, this two-storied pagoda is dedicated to the boar manifestation of Ajima, the protector deity representing the female force. Visit the World Peace Pagoda, a massive Buddhist stupa located on a hill top (Rani Ban) just behind Phewa Lake. This stupa is the symbol of peace where the huge idols of Lord Buddha from Japan, Sri Lanka and Thailand have been installed. Next is Bindhyabasini Temple, the center of religious activity in the old bazaar. It is dedicated to Goddess Bhagawati, yet another manifestation of Shakti. You will also visit Devi’s Falls, locally known as Patale Chhango, Devi’s Falls (also known as Devil’s, Devin’s or David’s) is an awesome waterfall lying about 1 km south-west of Pokhara airport on the highway to Tansen. Legend has it that a trekker (Devin, David…) was washed away by the Pardi Khola (river) and disappeared down into an underground passage beneath the fall. Gupteswar Gupha (cave) is a sacred cave located near Devi’s fall. The cave is almost 3 km long. It has some big hall-size rooms and some passages. This cave holds special value for Hindus since a phallic symbol of Lord Shiva is preserved here in the condition it was discovered and taking pictures inside the cave is prohibited. Afterwards, head to the Tibetean Refugee Camp where since 959, a group of Tibetan refugees have been living in Nepal. One such is Tashiling Tibetan Refugee Settlement at Chhorepatan, which is located near two popular sightseeing sites i.e. Davi’s fall and Gupteshwar Mahadev Cave. One may visit Tibetan monastery, hand-made carpet factory, schools etc. in this community. Finally, visit the International Mountain Museum. The museum is situated just 0.5 km south from the Pokhara airport. The spot is rightly selected as we can enjoy the unique view of 3 massive mountain peaks; Dhaulagiri, Annapurna and Manaslu which are above 8000 meters. No place in the world offers us such a panoramic view. At the end of the tour, you will be dropped back off to your hotel in Pokahara, or you can choose to explore further or eat at the lakeside market on your own.